One of the least visited areas of the island, yet it's one of the most beautiful parts of the island. Life here hasn't really changed much, managing to escape mass tourism and over-development. You can experience 'true' Samui here, and you should. Lush vegetation with coconut palms the predominate feature of hillsides that lead down to an area of the island that has been barely touched by tourism or development. Below the back drop of the mountainous interior life goes on for many as it has done for centuries. Taling Ngam, the centre of life here is a quaint little village with many traditional Southern Thai style wooden houses. Families here go back many generations and are content to continue their traditional lifestyle. The rivers and bays are lined with long-tail boats that deliver a daily catch of fish, while shellfish are collected by hand along the shores. 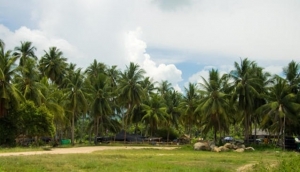 Some of Samui's best beaches can be found here, where the the jungle does truly meet the sea. You can easily find yourself a shady spot under a tree on the beach enjoy it to yourself, the waters here are clear, calm and shallow, perfect for kids and swimming. To top it off it's the best spot on the island to catch the setting sun over the beautiful and mysterious Five Islands.